More than 150 tradesmen and women have taken part in a rally in protest at a rise in van tool thefts. 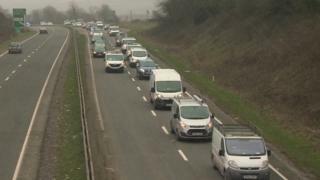 Work vans travelled in convoy from the A38 near Ivybridge, Devon, into Plymouth city centre on Sunday to show their frustration. Devon and Cornwall Police said there has been a "sharp increase" in the number of van thefts in the city in the past year. Rally organiser Paul Davenport said: "We just want to get something done." Concerns on Facebook group Plymouth Area Spreads and Builders from tradesmen about van break-ins inspired plans for the protest rally to take place. The workers have claimed the thefts are being carried out by organised gangs and said the police do not seem to have the resources to tackle the problem. Ryan Cooper took park in the convoy after recently losing £3,000 worth of tools. He said on one occasion he even witnessed his van being broken into. "I heard some funny noises outside so I've gone outside and had a look over the hedges and saw two guys hanging out the back of my van," he added. "So I instantly shot out there to find out they've ran halfway down my street with hands full of power tools." Police said that over the past few months alone, tens of thousands of pounds worth of power tools have been stolen from vans parked around Plymouth. Insp Nick Lindsey added: "Offenders are accessing the rear doors of vans, often causing little or no damage. "I want to urge people to consider marking their tools and equipment." A Home Office spokesperson said the government understands the "distress and disruption" tool theft causes and remains "alert to trends and new methods used by criminals to commit crimes". It added that police funding will increase by up to £450m next year with around £270m going direct to forces to spend on local priorities.